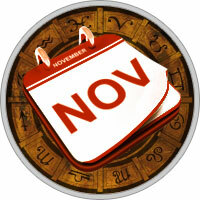 A period of trouble-shooting, this month does offer potential for change. But before you can effectively make modifications you may have to complete something that’s been dragging along. To avoid venting your frustrations or stress into inappropriate areas, concentrate extra effort in your fitness activities. That could mean exercising five days a week instead of two or three. The added energy is an extra dividend. Resolve family issues immediately, since allowing anything to brew now is just asking for trouble. The Moon on November 7 offers an opening that could free you of obligations in the family that you no longer need to carry. Your own life takes a creative turn, and your rdeas, coupled with the vision of a trusted partner, renew your hope. You’re eager to do something purely romantic during the Moon on November 23. Mercury retrogrades for the last time this year from November 4 to 24, when serious research into root causes of problems provides illuminating results. This can be an exceptionally frustrating period for travel, when delays are more the order of the day. At work, clarify your objectives and reconfirm everything, since distractions run rampant after November 17. Quiet plans for something completely different are in the works after November 26. Put the finishing touches on a long-term project, when calling in a few favors might also provide a chance to turn the tide in a previously difficult situation.